What do you think of when you picture riding with your entire family? The family bliss, fresh air, all cruising along together happy and smiling. The reality is, as I found out is that while there may be moments like these, there will also be moaning and complaining, the occasional grazed knee and tears! Don’t be discouraged at this reality-it will get easier and it will be fun (eventually!). We headed out as a family all-full of the joy of the outdoors. This lasted exactly five minutes until the going got tough and the tough started complaining. Intrepidly we continued – pushing, stopping and bribing – until a brief moment of communal joy at being out “mountain biking” enveloped us through the dappled shade of the trees. Very brief and then the moaning ensued at the first bump in the road, so to speak! 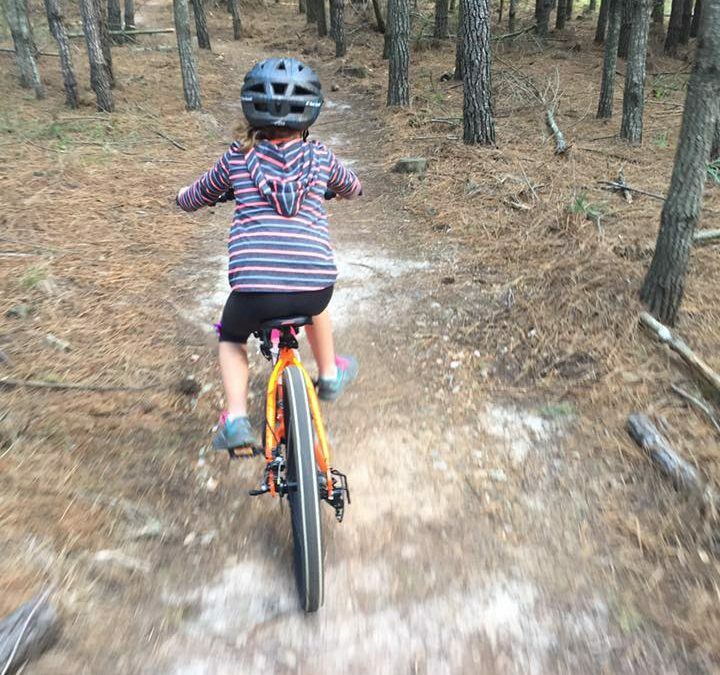 So we adjusted our expectations and shortened our expedition- our youngest having “experienced mountain-biking” enough for one day. After all tomorrow is another day. Check their helmet and make sure it still fits properly and has not been damaged. A good quality helmet is the best investment you can make. Make sure you have plenty of water and snacks to keep energy levels up and something sweet to bribe with!!! Remember not to underestimate your child’s abilities-they are capable of more than you think. Note to self – don’t impose your fears of falling etc. onto them. Listen to your children, don’t push too hard and eventually it will become easier and more fun for all of you! And this will hopefully become a life long passion for two wheels.